When John Matthews-Bey walked his little girl into her Baltimore City Head Start classroom 40 years ago, he had no idea that he’d remain at Head Start decades later as a much beloved and appreciated teacher. “For me, it’s all about the children. You have to love the children,” said Matthews-Bey, who was one of 113 Catholic Charities colleagues honored during the 42nd Annual Employee Milestone Luncheon, which was held aboard the Spirit Cruise Ship on Sept. 28. “When the children and the parents come to school, I always let them know they’re welcome here,” said Matthews-Bey. He beamed as Executive Director Bill McCarthy read letters from parents and students praising Matthews-Bey as a role model. The milestone luncheon and cruise through Baltimore’s Inner Harbor toward the Francis Scott Key Bridge fell on a warm and sunny day, which was a welcome break from the rain. The employees ranged from St. Vincent’s Villa classroom aides to Esperanza Center case managers, public school therapists, and caregivers from Gallagher Services and Jenkins Senior Living. All honorees gathered in the ship’s dining room for a buffet lunch and the recognition ceremony, which was punctuated by enthusiastic applause. In addition to McCarthy, the staff was recognized by Assistant Director Mary Anne O’Donnell, Community Services Director Amy Collier, Senior Services Director Arnold Eppel, Family Services Director Kevin Keegan, Chief Development Officer Rita Walters and Finance Director Scott Becker. Becker also celebrated his 10th year of employment with Catholic Charities. Later, staff enjoyed the warm breeze and sun from the upper deck of the ship. “This is so nice,” said Donita Green Blake, a 20-year employee at Gallagher Services in Timonium who sat with her colleague, Marsha Young, who has worked for Gallagher Services for 15 years. 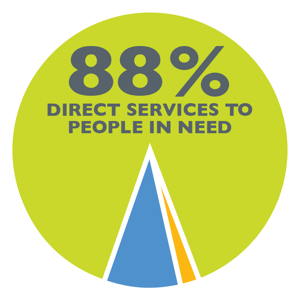 FACTOID: Catholic Charities of Baltimore is the largest nonprofit service provider in the state of Maryland. Our organization has the fifth highest number of full-time employees out of the 167 diocesan Catholic Charities that are members of the Catholic Charities of USA. The top five Catholic Charities include: #1 – Seattle with 2,600 full-time employees, followed by Chicago, New York City, Brooklyn/Queens and in fifth place Baltimore.